You are in the wrong part of town on the wrong day. You have found yourself in the middle of a riot ravaged neighborhood a long way from home. People are throwing their possessions out their windows! 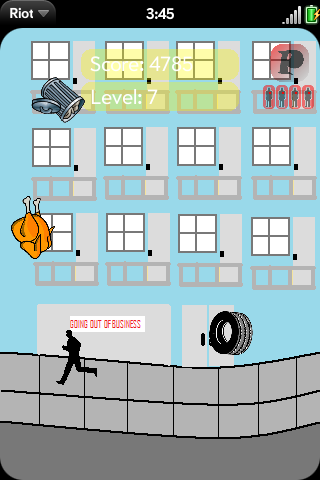 You need to avoid all of the falling objects. The accelerometer will run your man back and forth across the screen, and you can use the keyboard as well. There are currently 12 different neighborhoods. Each one is increasingly challenging with more junk coming at you as you get closer to home. While you are in a bad spot, you may still get lucky and find some presents along the way to help you along on your journey. Good luck and run fast!